In a 4- to 6-quart slow cooker, combine the hoisin, soy sauce, cornstarch, ginger, garlic, sesame oil, cloves, and ¾ cup water. Add the pork and turn to coat. Cover and cook until the pork is very tender, on low for 7 to 8 hours or on high for 5 to 6 hours (this will shorten total recipe time). Twenty minutes before serving, cook the noodles according to the package directions, adding the broccoli during the last 2 minutes of cooking. Using 2 forks, shred the meat. Add the vinegar and mix to combine. 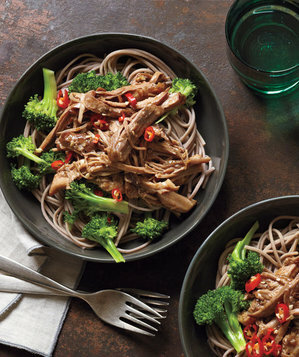 Serve the pork over the noodles with the broccoli and chilies.